Ah, those lovely sweet & salty onions with which we gloriously top our burgers, steaks, raviolis and more with. There’s a couple ways to get there. 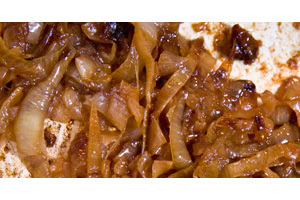 Browning is a relatively quicker process of browning the outside of onions using a high-temp oil and medium-high heat. Caramelizing is the slower process of sautéing onions in olive oil on medium to medium-low heat over a period of about an hour until the onions are completely browned. In terms of flavor, I think that caramelizing is clearly superior…the end result is simply sweeter, saltier & oilier, which is what we’re after, in our kitchen at least. Browing onions is easy and quick. Add to a pan some high-temp oil over medium-high heat. When the oil begins to smoke, add the onions. Stir often, to avoid burning, for about 15 minutes. You are done when the onions are cooked and the edges of most of them are nice and brown. Add some salt and pepper to taste. 1. Heat a wide pan or wide dutch oven to medium-high with olive oil to coat the bottom. Add the onions. 2. Turn the pan down to medium. Cook for 20-30 minutes before stirring. Essentially, you want to brown an entire layer of onions first. 3. Next, ideally, you want to try to flip the onions. The objective is to keep even browning and even heat on the onions. 4. You’ll need to flip/stir a few times more. You may need to add a couple tablespoons of water to release the fond and avoid burning. 5. Within an hour, your onions should be perfectly browned. If you’ve got the time, go for caramelization. Make more than you need and freeze some in small batches, add to soups, eggs, etc.